I make garlic spaghetti, or spaghetti aglio e olio, at least once a week. It’s the perfect go-to weeknight dish, because it’s fast, comforting, and can be as healthy (or not) as you want to make it, depending on your mood (or more often, what’s in the fridge). I have plenty of variations: sometimes with shrimp and a little white wine, often with asparagus or peas, occasionally varying the pasta shape, adding a squeeze of lemon at the end. But the basic recipe remains the same: extra virgin olive oil, crushed red pepper, parmigiano reggiano, and garlic, lots of it. In summer, I also love to add fresh, local tomatoes from the farmers market, but off season, tomatoes can be just awful. In winter I never ask for tomato on a sandwich I’m ordering, because more often than not it will be a pasty, pale pinkish color, and have exactly no flavor. My slipper would taste better. But I recently discovered a wonderful trick for turning lackluster tomatoes into little flavor bombs from this recipe at Smitten Kitchen. I made a few tweaks for our love of garlic and heat, and I am now hooked on this version for garlic spaghetti, at least in colder months. It’s is also an amazing topping for pizza, or to smear on some crostini. This is an easy thing to do any day or evening you have some time, and then put in the fridge to use later in the week, or freeze for longer storage. 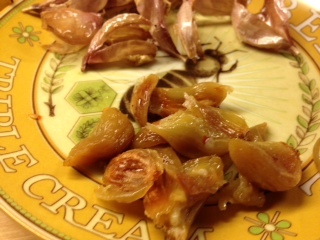 I’ve also occasionally added other ingredients to the pan along with the tomatoes and garlic, with great results: thick slices of onion (amazing on pizza! ), spears of asparagus, quartered or halved mushrooms. Some vegetables might need removing sooner than others so if you experiment with other veg, check the pan every 20-30 minutes and remove as needed. Preheat oven to 250°. 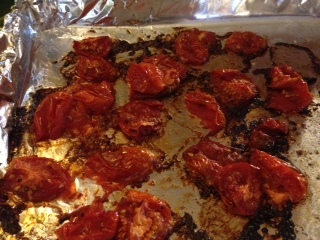 Place the tomatoes and garlic on a sheet pan lined with foil, keeping them separate (as you’ll probably be removing the garlic sooner than the tomatoes, keeping them separate makes that easier). Drizzle with olive oil, sprinkle with salt & pepper to taste. Add some crushed red pepper to the tomatoes if you like. Using your hands, gently toss to make sure they are evenly coated with oil & spices. Place pan on middle rack in oven. Check after 30 minutes, and every 30 minutes thereafter until the garlic is browned in its skin and very soft, and the tomatoes have lost some moisture, are concentrated and edges have begun to caramelize. Each time you check on the tomatoes, use a spoon to move them around a little to be sure they’re not sticking too much or burning, but don’t worry if you see a few brown bits stuck on the foil, as long as the tomatoes still move around. 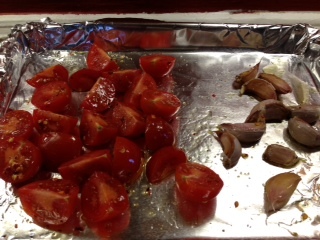 In my oven, the garlic went about a half hour, the tomatoes another hour past that (about 90 minutes altogether). 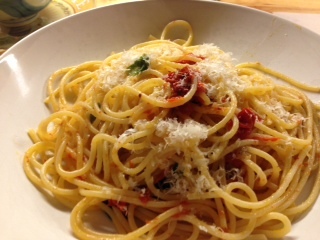 Serve in two large bowls, with parmigiano reggiano sprinkled on top to taste. Buon appetito!